It is not a peaceful time in the Dells. In King City, the young King Nash is clinging to the throne, while rebel lords in the north and south build armies to unseat him. War is coming. And the mountains and forest are filled with spies and thieves. This is where Fire lives, a girl whose beauty is impossibly irresistible and who can control the minds of everyone around her. Exquisitely romantic, this companion to the highly praised Graceling has an entirely new cast of characters, save for one person who plays a pivotal role in both books. You don't need to have read Graceling to love Fire. But if you haven't, you'll be dying to read it next. This edition includes an article by and an interview with Kristin Cashore, as well as a sneak peek at her next book, Bitterblue! The long-­awaited companion to bestsellers and Eight years after, Bitterblue is now queen of Monsea. But the influence of her father, a violent psychopath with mind-­altering abilities, lives on. Her advisors, who have run things since Leck died, believe in a forward-­thinking plan: Pardon all who committed terrible acts under Leck's reign, and forget anything bad ever happened. But when Bitterblue begins sneaking outside the castle--­disguised and alone--­to walk the streets of her own city, she starts realizing that the kingdom has been under the thirty-­five-­year spell of a madman, and the only way to move forward is to revisit the past. Two thieves, who only steal what has already been stolen, change her life forever. They hold a key to the truth of Leck's reign. And one of them, with an extreme skill called a Grace that he hasn't yet identified, holds a key to her heart. Amazon.­com ReviewIf you had the power to kill with your bare hands, what would you do with it? Graceling takes readers inside the world of Katsa, a warrior-­girl in her late teens with one blue eye and one green eye. This gives her haunting beauty, but also marks her as a Graceling. Gracelings are beings with special talentsâ€”swimming, storytelling, dancing. Katsa's Grace is considered more useful: her ability to fight (and kill, if she wanted to) is unequaled in the seven kingdoms. Forced to act as a henchman for a manipulative king, Katsa channels her guilt by forming a secret council of like-­minded citizens who carry out secret missions to promote justice over cruelty and abuses of power.­Combining elements of fantasy and romance, Cashore skillfully portrays the confusion, discovery, and angst that smart, strong-­willed girls experience as they creep toward adulthood. Katsa wrestles with questions of freedom, truth, and knowing when to rely on a friend for help. This is no small . . . When Queen Bitterblue took the throne of Monsea, she was a child, and her advisers ran the kngdom for her. Now she is beginning to question their decisions, especially how they handle the legacy of her father Leck, who who ruled through his Grace&#8212;­a special talent for mind-­altering&#8212;­and his taste for darkness and violence. Bitterblue needs to know Monsea's past to lead it into the future, so she begins exploring the city sreets at night, disguised and alone. As she does, she meets two thieves, who hold a key to the truth of Leck's reign. And one of them, with a Grace that he hasn't yet identified, holds a key to her heart. Bitterblue is unforgettable&#8212;­a gateway to the Graceling Realm that braids together magic, memory, and romance. 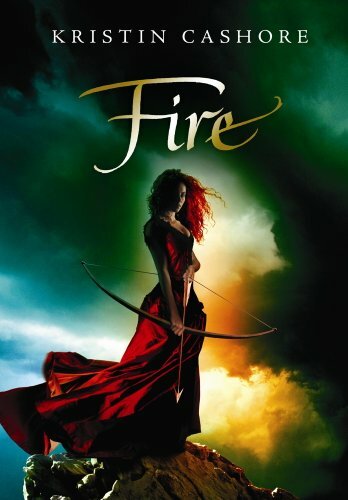 A must-­read title for all fans of Patrick Rothfuss and Trudi Canavan, FIRE is an exceptional fantasy novel. From the deft characterisation to the gripping story, the fast-­paced action to the evocative prose, this is one of the strongest fantasy novels of the year. Aware of her power, and afraid of it, Fire lives in a corner of the world away from people, and away from temptation. Until the day . . . The highly anticipated standalone from the award-­winning, New York Times bestselling author of the Graceling Realm series&#8212;­a kaleidoscopic novel about grief, adventure, storytelling, and finding yourself in a world of seemingly infinite choices. Jane has lived an ordinary life, raised by her aunt Magnolia&#8212;­an adjunct professor and deep sea photographer. Jane counted on Magnolia to make the world feel expansive and to turn life into an adventure. But Aunt Magnolia was lost a few months ago in Antarctica on one of her expeditions. Now, with no direction, a year out of high school, and obsessed with making umbrellas that look like her own dreams (but mostly just mourning her aunt), she is easily swept away by Kiran Thrash&#8212;­a glamorous, capricious acquaintance who shows up and asks Jane to accompany her to a gala at her family's island mansion called Tu Reviens.